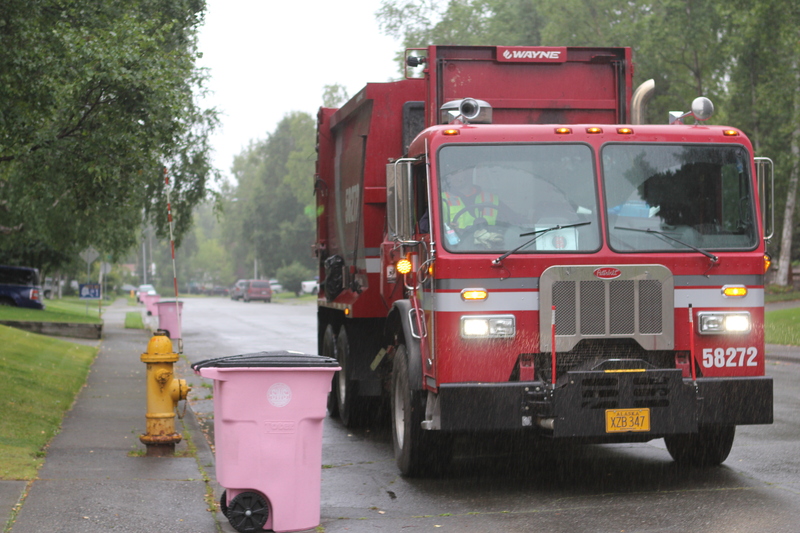 It’s not even 7 a.m. when Solid Waste Services’ employee Garret Fairclough hoists himself into a massive red garbage truck and starts filling out paperwork. The engine fills the cab with warm air as he pulls out of the Central Transfer Station, makes a pit stop for coffee and starts his route. Fairclough is following a map he made himself around the city. One man stares at him in confusion, worried that he’s forgotten trash day. But, he hasn’t. Instead, Fairclough’s on the hunt for pink trash cans filled with yard waste and food scraps. He’s one of two drivers picking up for the 280 customers participating in this summer’s Curbside Organics pilot program. Everyone who signed up in time and met the program requirements were invited to join in. Fairclough dumps the organic material off at American Landscaping at the end of his route. 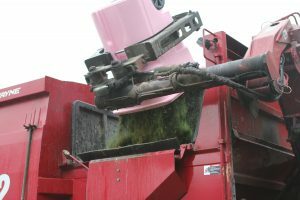 They turn it into finished compost, a nutrient-rich soil amendment that can be added to gardens. Aside from wet grass sticking to the bottom of the cans, a stray piece of Styrofoam and having to figure out a new route, he says things are going smoothly. Solid Waste Service’s recycling coordinator Suzanna Caldwell said they’ve collected more than 14 tons of organic material since the program started in June. Caldwell said community garden groups and customers urged them to look into more options for composting. So they collected yard waste in one neighborhood last summer and started a program where people can exchange five-gallon buckets of food scraps for finished compost. 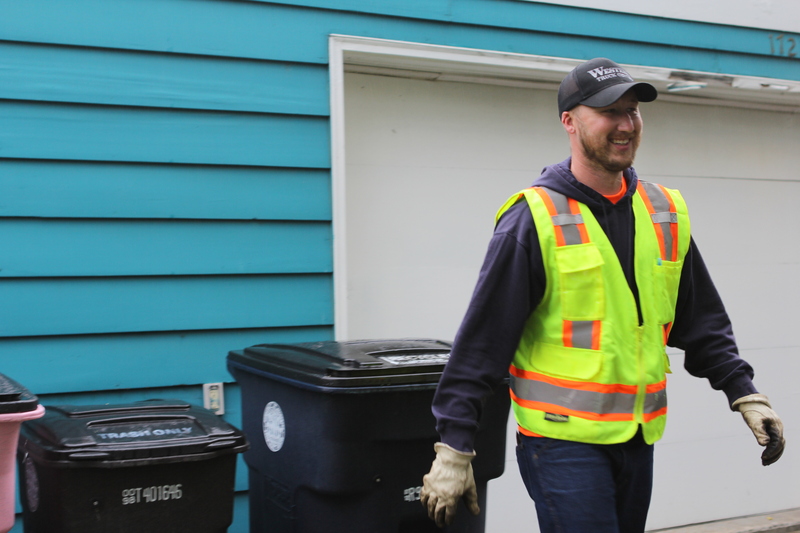 This summer’s pilot program expands services further and could lead to curbside composting for their entire service area, which covers nearly a quarter of the city. “This is just one piece in helping us figure that out for the long-term,” Caldwell said. Solid Waste Services is footing the bill for the $7000 program using the recycling fund, which adds $1.50 to every ton of material that passes through the landfill. They’ll know more about what a service-area-wide program would cost after the pilot program ends in October. But Caldwell says customers would pay a fee for the service, just like with recycling and trash collection. Caldwell said giving them the option is important. That’s important to program participant Edith McKee, too. McKee grew up in Anchorage and has been composting on and off since childhood. But she can’t throw food scraps in her backyard pile because of her dogs. A banana peel, strawberry tops and bits of greens fill a screw-top five-gallon bucket behind her house. McKee dumps it in the pink bin the morning of pick-up, and so far, she said she hasn’t had any issues with bugs, smells or wildlife. If she could change anything, she’d get rid of the biodegradable bag that lines the bucket and expand what’s allowed in. Meat, citrus, weeds and compostable containers didn’t make the cut. McKee sees the program as a step in the right direction. “Anything we can remove from landfill and use in the community in another way is a benefit to everybody really,” McKee said. Solid Waste Services will start analyzing the data from the pilot program when it finishes in the fall and hopes to expand next year. 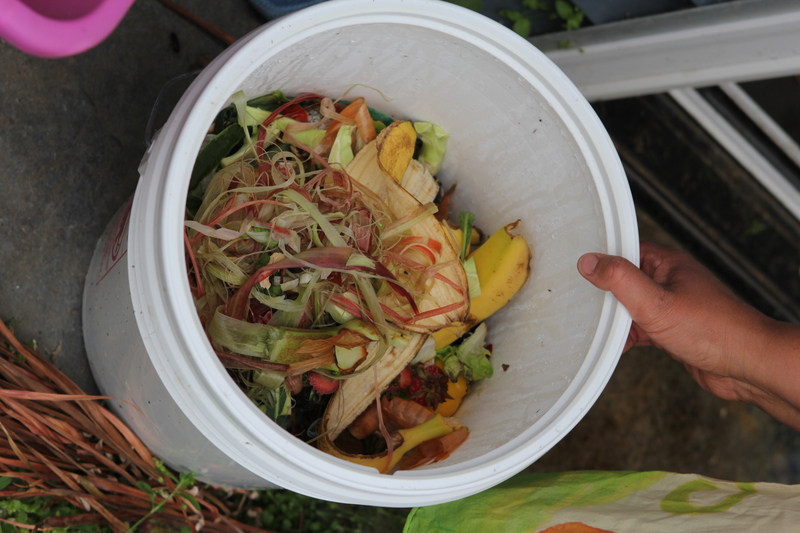 Year-round curbside compost pick-up for all customers could be on the horizon.